Many tourist guides will tell you the Ronda bullring is the oldest and largest in Spain, in fact the story is confusing. 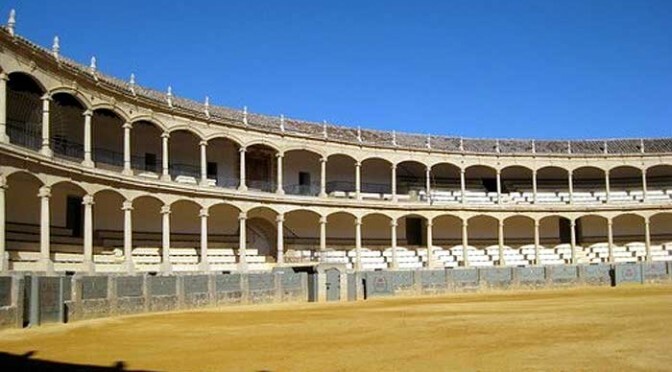 Our little bullring only has seating for 5,000 spectators, hardly the largest in the world, but the rueda, which is the large round circle of sand, is the largest in the world at 66m, making it 6m larger than Spain’s biggest bullring, the Plaza Toros Las Ventas in Madrid . The second inaugural corrida occurred on May 19th 1785 and featured Pedro Romero and his greatest rival in the ring Pepe Hillo, by all accounts a day to be remembered in Ronda as one of one of bullfightings greatest moments. All of Ronda’s most noble families were in attendance, and the town was bedecked in flags while in the streets a great party was going on. Ronda’s bullring, whilst perhaps not the oldest in Spain is definitely the oldest bullring constructed entirely of stone, most others being constructed with a combination of stone and brick. Our bullring, designed by José Martín de Aldehuela is unique in having all of the seating under cover. The stands were constructed in two levels of seating of 5 raised rows per level and 136 Tuscan sandstone columns forming 68 arches provide support for the top level of seating and the roof of the Plaza de Toros. The main entrance to the bullring, completed in 1788, four years after the rueda and seating was constructed, was designed and built by a Rondeño, and master stonemason, Juan Lamas. The design features two tall tuscan columns with the royal shield of Spain at the top centre surrounded by baroque edging. The main door is large enough for horses and carriages to enter the rueda, and above the door is a central balcony featuring wrought iron metalwork with imagery that evokes the culture of bullfighting. In 1923, when the original Espinel theatre was constructed in Plaza Blas Infante, the main entrance of the Plaza de Toros was relocated to Virgen de la Paz, where it still stands today across the street from the Restaurante Pedro Romero. In the 1980s the old Espinel theatre was demolished and a new theatre built in Alameda Park. In July 2009, when the car park next to the Plaza de Toros finally closed, a competition to design new gardens that suit the era was organised. At the same time, historians in Ronda suggested moving the entrance back to it’s original location. During the Feria Goyesca held in the second week of September, an event created by Ronda’s bullfighting maestro Antonio Ordoñez, a bullfight in honour of Pedro Romero is held, often including members of the Ordoñez family, Ronda’s second bullfighting dynasty. The bullfighters and their assistants all wear costumes reminiscent of those worn by characters appearing in Goya’s paintings, whilst the ladies delight in showing themselves off in the most gorgeous dresses. The museum in Ronda’s Plaza de Toros, the Museo Taurino, contains many of the most important outfits and bullfighting regalia from the last two centuries, as well as an extensive collection of weapons used by the Real Maestranza during Spain’s many wars. Previous PostThe White Villages (Pueblos Blancos)Next PostGrazalema Cycling – Guided tours, Self Guided and Bike Hire.